Another fudge recipes? You betcha! 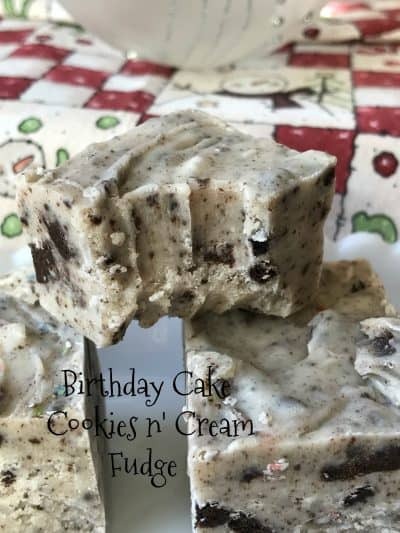 Birthday Cake Cookies n’ Cream Fudge is super delicious. Made with Limited Edition, Mickey Mouse Birthday Cake Oreo Cookies which celebrates 90 years of Mickey. I bought a package of cookies for my grand-daughter but before I could give them to her, her papa ate half the package. Shame on you papa! So I bought Willow another package of cookies and made this fudge with the rest. 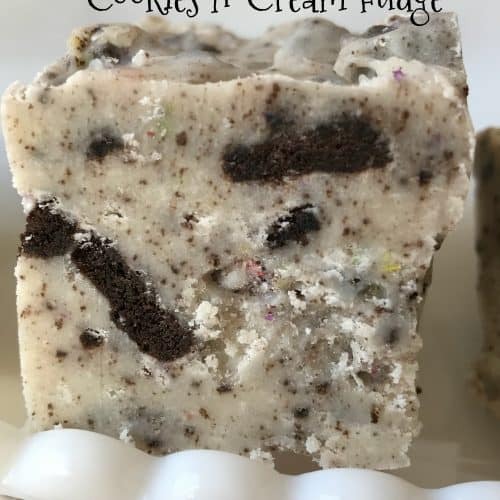 Cookies n’ Cream Fudge is a delicious fudge that comes together quickly. I thought it was on the sweet side. I made the mistake of making this fudge in an 8 x 8-inch square baking pan, which may have contributed to the fact that this fudge was on the sweet side. Definitely needs to be made in a 9-inch square baking pan. 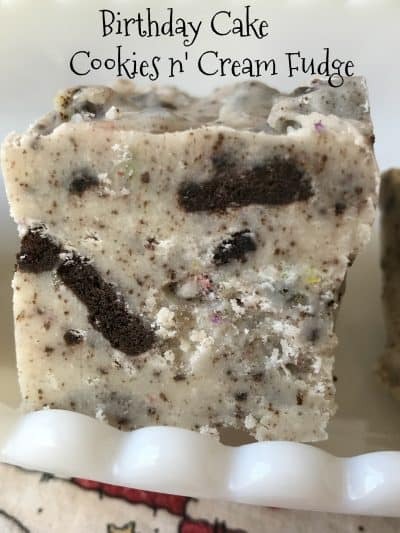 I did find the cream filling of these cookies an the sweet side also but all in all Birthday Cake Cookies n’ Cream Fudge is fantastic. Over 50 Kinds of Oreo Cookies? To celebrate the Milwaukee Brewers Game 6 win, we decided to serve up a big plate full of fudge. Three kinds of fudge to be exact…Birthday Cake Cookies n’ Cream Fudge, Spicy Dark Chocolate Fudge and White Chocolate Coffee Toffee Fudge. I can’t think of one person that would pass on a plate full of fudge at a party. Can you? Last night the Milwaukee Brewers lost game 7 and will not be going to the World Series. They tried and had a great year but now it’s time to get back to our regular scheduled programming. 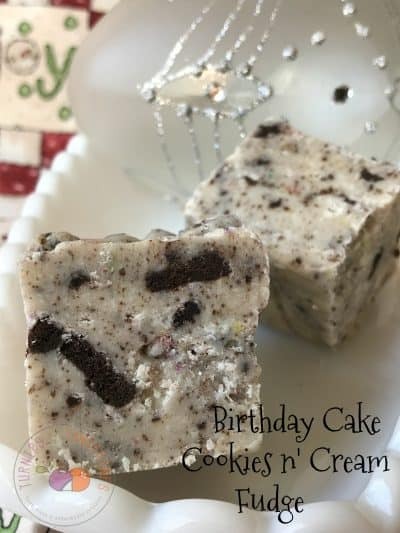 A delicious cookie made with Mickey Mouse Birthday Cake Oreo Cookies. LINE 8-inch-square baking pan with foil. Lightly butter. Set aside. Want more Oreo Cookie recipes? Try these: Oreo Cheesecake Filled Shells, Chocolate Covered Oreo Cookies and Minion Munch a Bunch. And what about Cookies n’ Cream Cereal Treats? Delicious!